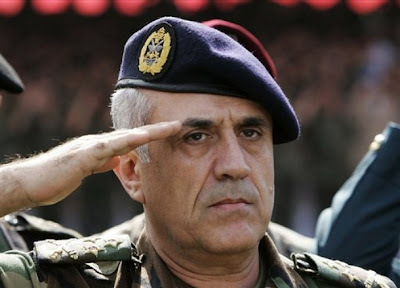 -They are electing for the second consecutive time an Army general with no popular support, no political program and the military establishment as his last refuge. -They have again interpreted, modified and frankly wiped their bums with the nation’s constitution to the point that its validity as a useful reference document has to be questioned. -The media war between various factions shows no sign of let down with accusations of treason and counter treason. -While a cabinet of national unity might defuse the tension on the street, previous experience with that format have led to stagnation and inefficiency in government. -Instead of a direct confrontation between the Shiite and Sunni factions, the nearing electoral contest is likely to heighten tensions within the Christian street, as other constituencies are more or less guaranteed to one or the other of the dominating sectarian tribes. -The issue of Hezbollah’s weapons has not been resolved. There is less of a consensus on them than ever before and any clash with Israel is likely to resurrect internal grievances. -Other factions are likely to continue rearming following the defeat they suffered at the hand of opposition militias. -The economic situation is dire for the majority of the population. Its resolution is not a priority for any of the major parties. - There has been no improvement in the relationship with neighbouring Syria. -The perpetrators of the assassinations and other act of terrors since 2005 have still not been identified. The international tribunal for Lebanon remains an empty promise. -The situation of Palestinian refugees remains dramatic. While the threat of their ‘settlement’ is used in the internal political bazaar they remain economical and social pariahs in the country where many of them were born since 1948. - Secularism is not on the agenda. I probably missed something and would be gladly reminded of it. On the positive side General Suleiman’s primary school teacher reassured us in an Al-Jazeera interview that the young Michel was ‘popular at school with every other pupil requesting to be sat next to him’. I breathe a sigh of relief! So very well said, unfortunately. Irrespective of what you and others - including myself - think, are the Lebanese ready for this change? And if they are, is there a venue to vent those feelings that you bring up in this article? The majority of political players? A definite NO. The media? With minute exceptions, again NO. With that in mind, it is hard to foresee change anytime soon. We have yet to have an honest political conversation in the Land of the Cedars about what our vision for the future is going to be. Forget about secularism and relationship with Syria and Israel for one second. I would have wanted a conversation about accountability. Is the judiciary system really independent? According to the Constitution of the Republic, it is. In reality it isn’t. In the defense of the Lebanese, however, I would say that unlike many nations around the world, which are either mono-religious or mono-cultural, our diversity is proven once again an impediment to our progress. Everyone is a little racist I guess, even when you refuse to admit it. The lack of objectivity at the judiciary, media, and parliamentary levels reinforces this obstacle to progress. This is also portrayed at the individual level as indicated by some of the responses received on your blog in response to the various articles and opinions posted. I was amazed by how quick people were at accusing you of subscribing to one party or another and delve into more personal attacks when the subject doesn’t agree with their core beliefs. Of course this habit of longing for foreign intervention to resolve internal problems doesn’t help either. Running the risk of receiving more hate mail accusing me of Baathism, I can't but find myself perplexed at the tone, and self denial the Lebanese seem so engrossed in. All interviews on TV with "people", normal people on the streets after the Doha agreement, seems to have one cliche, everbody says "WE LEBANESE [please note, WE Lebanese and ONLY lebanese] love eachother, we are a people who cant live without freedom, we are.. we are..."
It makes you wonder, were they the same people who, merely a few days before, were shooting at eachother like there was no tomorrow, brining back the old racist vocabulary, and at the very least accusing the other side of treason. Not to mention the 15 years of war. It perplexes me how good they are in placing the blame on everbody else but themselves [AND I AM TALKING ABOUT AVERAGE PEOPLE! ], it's always, the usual suspects, The Leaders, Syria, US, Iran, Saudi Arabia, France, Palestinians... But it's never them peace-loving freedom-huggers of lebanon! [Whether they are a "life lover" or non-"life lover", the same disillusioned vocabulary seems to take over]. I am making grand generalizations btw, but I am sure you understand the gist of what I want to say. I want to know, why isn't EVERYONE outraged about this disgusting system of "mu7asasa". The mere fact that them leaders were discussing "their" portions in the new electoral law should send out red flashing loud signals that this is a flawed law that can not bring a democratic representative parliament. Why isn't there 10,000 people in Martyr square calling for secularism, for proper elections, for a feeling of statehood. I'm not just perplexed, I'm really sad for it. I'm not just someone who is looking from the outside, I lived in Beirut for days on end, my dad stayed there for 10 years when he was not allowed in Syria, I have very warm memories of that place, and ironically, of its people. The left has a truly historic role to play in changing this country, but to be honest I can only see shadows of the late LCP and the Communist Labor Party, and, and... They seem like they are ready themselves to succumb into that same sectarian game. Both your comments Yazan and Marwan highlight an important point: The Lebanese need to start taking responsibility for their future and also their past. Blaming the leaders is pointless, we keep electing them again and again (As Ziad Rahbani put it as early as 1976, we as a people have an incredibly short memory). We should also stop blaming foreign interference. If we had a solid integrated society this interference would be minimal, just as it is in many other countries. Ultimately, and thats in answer to you Yazan, this way of thinking is not unique to the Lebanese. The Arab world has always thrived on the belief that all their problems are due to a western conspiracy linked to corrupt Leadership. How many have tried to look at their own role and done something about it? You pretty much summed up the fundamental issues in the country. You have stripped it down to the simplest list, and that's awfully hard. I mean, it's even harder than listening to a whole George W. address, from beginning to end. however, im still asking myself y did the leaders of March 14 vote for pour new president ? does any body know y M.Ahdab emphasized this morning that he wasnt the one who "voted" for Nasib Lahhoud ? ?any idea ;-) ??? Is it the function of the Army to generate political leaders? Only in dictatorship. I have nothing against Suleiman. It is the process that is shameful. And to be honest with you I am glad that not everyone voted for him. Lets leave the 99.9%votes to others please. joseph dear, i was noticing a fact,period; u think im with dicatorships??? I know you thrive on provoking others and that is fine. but with all due respect, this 'why dont you do criticize the others as well?' is becoming repetitive. This post was not about the leaders, but the public, all the Lebanese public. Siniora and Hariri are not my leaders, I have no influence on them and I have nver asked them to fulfill my aspirations (which by the way are a secular democratic just Lebanon for all its people, in case you have a problem with that). I am an unaffiliated Lebanese citizen who disagrees with the political system, is opposed to the current economical policies but also disapproves of a radical Islamist party waging war on in my name. It is my right, I hope you will respect it but I will pass on lessons in patriotism. oh dear, it must be boring for ya to read the same old thing over and over... the thing is that u never answer these BASIC questions, joe. Moreover, i think it's important for u to state weither yr writings emerge from a Realpolitik pt of view, or an Idealistic one; it makes all the differnce. u want me to criticize the Opposition, i'll do that when they become the "Authority"; but, till now, i think that they're doing a really god job. In my opinion, it's important to know when and where to be the Devil's advocate. I am not objective. I happen to have an opinion which seems unacceptable to you. And yes I find your lessons in patriotism boring. I dont agree with this pro-government vs opposition argument. In Lebanon the power is shared and doesnt necessarily emanate from the state. So Hezbollah was effectively sharing power, and Nabeeh Berri was part of it. You choose to support one sectarian group and I dont support any. Anyway now that we have the Doha accord let's see how your 'opposition' will fare. I cant wait for the ministry of Health to be run again by Suleiman Franjieh, tourism by Talal Arslan or the ministry of work by the SSNP. that this "difference" will lead us some where joe...it's a waist that it goes no where... tu ne crois pas ? If I was interested only in hearing my opinion we wouldnt created this site. I dont have a problem with you telling me again and again that I am wrong, preferably supported by arguments.It is the accusatory language that I find unnecessary. We are all looking for answers to our country's problems even if we reach different conclusions.